The 1986 Taurus, above, took the auto world by storm. The current version, below, not so much. 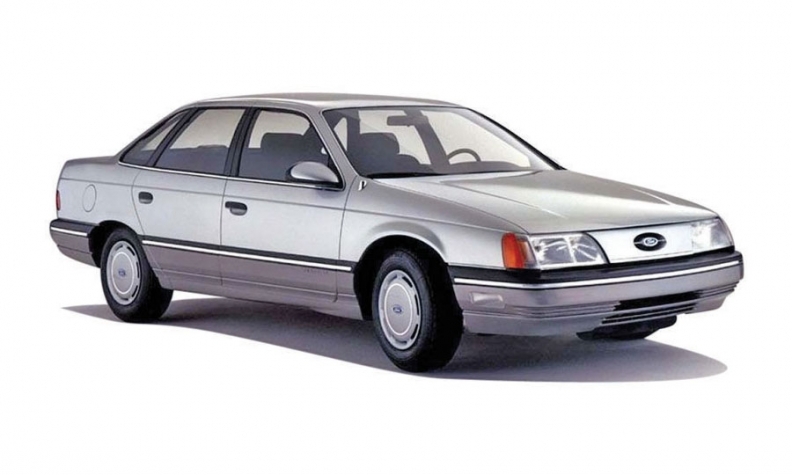 Ford rocked the auto world 30 years ago, and became a player again in the U.S. midsize sedan wars, when it replaced the slow-selling LTD with the pleasingly aerodynamic, front-wheel-drive Taurus. The Taurus was a smash from the start. Between 1992 and 1996, it was the best-selling car in the U.S., losing the title to the Toyota Camry in 1997. Sales lagged in the next decade, and the nameplate was discontinued in 2006. It was revived in 2007 when new CEO Alan Mulally ordered that the full-size Ford Five Hundred be renamed Taurus. But the old magic is gone. The Taurus has fallen on hard times, along with the entire large sedan segment. Sign of the times: In January, the former No. 1 car dropped out of the top 100 among all new light vehicles sold in the U.S. The Taurus finished 62nd in the rankings in 2013 and 78th in 2014. In January, sales dipped 19 percent to 3,006. That put the Ford sedan just behind Hyundai's Tucson compact crossover, which grabbed the No. 100 spot with 3,036 sales.